This Aug. 10, 2017, file photo shows the Trump International Hotel in Washington, D.C. The hotel, located blocks from the White House, has become both a tourist attraction in the nation's capital and also a symbol of President Trump's intermingling of business and politics. The Philippine Independence Day celebration set for June 12 comes as the country pushes for a free-trade agreement with the U.S. and amid international criticism of President Rodrigo Duterte for encouraging vigilante killings of drug suspects. 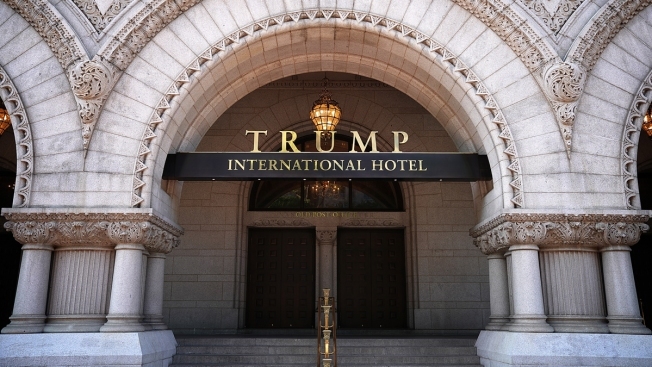 "The Trump hotel may have some political undertones because it is associated with the U.S. president," Jose Manuel Romualdez, the Philippine ambassador to the U.S., wrote in a column in The Philippine Star newspaper earlier this week. "But since several other embassies have also held their national day celebrations at the Trump hotel which were well attended — I decided — why not do it there, too." "The Philippines has found a way to pay tribute to our president," said Kathleen Clark, a government ethics lawyer and law professor at Washington University in St. Louis. "What's at risk is our foreign policy, that it will be influenced not by what matters — human rights, civil rights or legitimate economic interests — but by the Philippines' ability to get in the good graces of our president." There are economic concerns, too. With Trump's decision to drop out of the Trans-Pacific Partnership agreement, Duterte has to find another way to knock down barriers to an open exchange of goods and investment. He has been pushing for the kind bilateral free trade deal that 20 other countries enjoy with the U.S.
Two Turkish business organizations sponsored an event there in 2016. One of those groups had official ties to the government of Turkey. The Turkish group was previously headed by a businessman who hired former Trump administration national security adviser Michael Flynn and his consulting firm to perform work aiding Turkey. Flynn has since pleaded guilty to lying to the FBI and is cooperating with the special counsel's investigation into Russian meddling in the 2016 election.